Small issue, but I figured someone may have a fix. I just had my windshield replaced today and they scraped my steering wheel. Any good ideas to fix this? Did you bring this to the installer's attention? If they're reputable, they should take responsibility for the damage. That being said, I work for an auto glass company and I'm not sure what the installer did on the inside of your car that would gouge your steering wheel in that manner. I can't tell if that's injection-molded rubber or leather. If it's leather, ask your dealer if they know of a vendor that repairs leather. 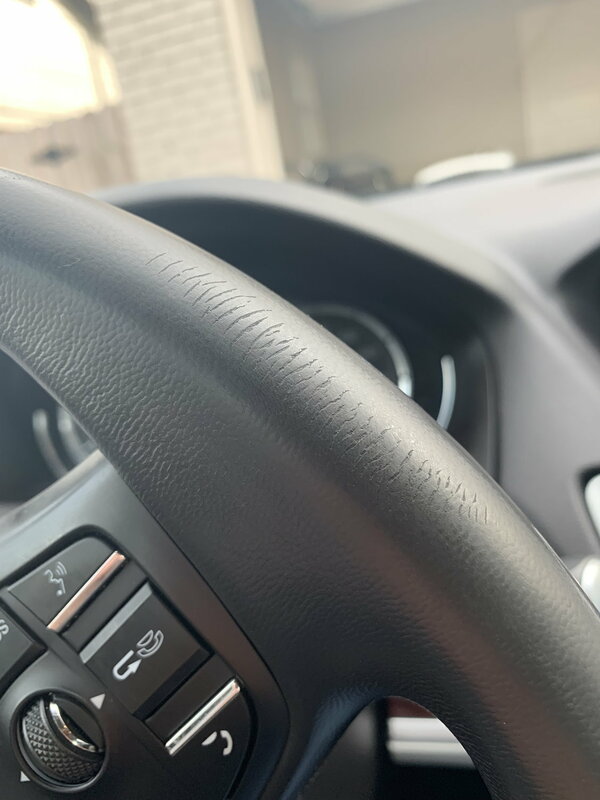 My 2018 TLX had a small scuff on the driver's seat, and the dealer set up a repair with one of their vendors and the scuff is no longer visible...even 1 1/2 yrs later. Last edited by Carnage719; 01-05-2019 at 02:39 PM. AGH! Exterior scuffs and grease!